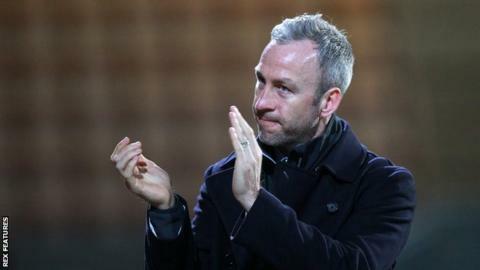 Cambridge United manager Shaun Derry believes "four wins out of five" will secure a play-off place for his side. The U's, who are unbeaten in three league games, are currently three points outside the play-off places. "It'll be those who go into the play-offs with momentum that put up the biggest fight," Derry told BBC Radio Cambridgeshire. "If we are to be that team that reaches seventh spot, I think four wins out of five needs to happen." Cambridge are 12th in the table and face a crucial game on Saturday at home to Carlisle, who are one point and two places above them. "Carlisle obviously will be disappointed they didn't pick up the three points last week against Mansfield. "They'll want to come down to our place and make amends for that," said Derry. "Most away trips for them are going to be overnight and sat on the buses for a long time, but I don't think that's going to play any part in the game to be honest. "Keith Curle is desperately trying to get Carlisle back into League One."